The dogs named Louis (pronounced Louie) and Gryffin were in the back seat when the suspect jumped in and drove away. FLORISSANT, Mo. 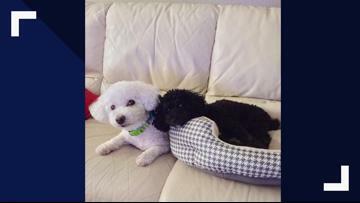 — A car theft in St. Louis County has one couple searching far and wide for their two pets. "They're never gonna come back and I'm never gonna see them again and I won't know what happened to them, that's my biggest fear," said Jaime Morton. It happened Saturday morning on Carmelita Lane in Florissant. Jaime said she was driving when she spilled coffee on herself, she then went home, parked her car in her driveway, and ran quickly inside. "I was in the house maybe 30 seconds getting a paper towel, soon as I walked into my garage, he had shut the door and that's when I grabbed it," said Morton. Gripping the door handle of her 2012 Kia Soul, Morton's arm was injured as the suspect drove away. "I held on as long as I could until I was drug to the ground," said Morton. "I went on pure instinct. I probably should not have grabbed the door and held on like I did, but that's the only thing I could think of was getting to them, getting to them." For Jaime's husband Matt, the thief got away with more than just irreplaceable members of their family. "I'm a 100% permanent and total and disabled veteran and these little guys are my emotional support animals," said Matt Morton who is a decorated United States Marine Corps Veteran. He calls the two his life force. "Once you bonded with that animal and you become that dogs person… words can't describe it," said Morton. The couple says the two dogs are inseparable and they both require medication. They asking for the public's help to get them back. "Just pray that if somebody did get them they're being taken care of, that would be something that I could at least hope for," said Jaime. Police said the suspect is a dark-complexioned, thin, athletic young man about 16 years old. He has short hair and was wearing a gray-hooded sweatshirt with yellow embroidery, and dark gray pants.